equipment for military & commercial aircraft, satellites, launch & space vehicles, missiles, automated industrial machinery, marine applications and medical equipment. 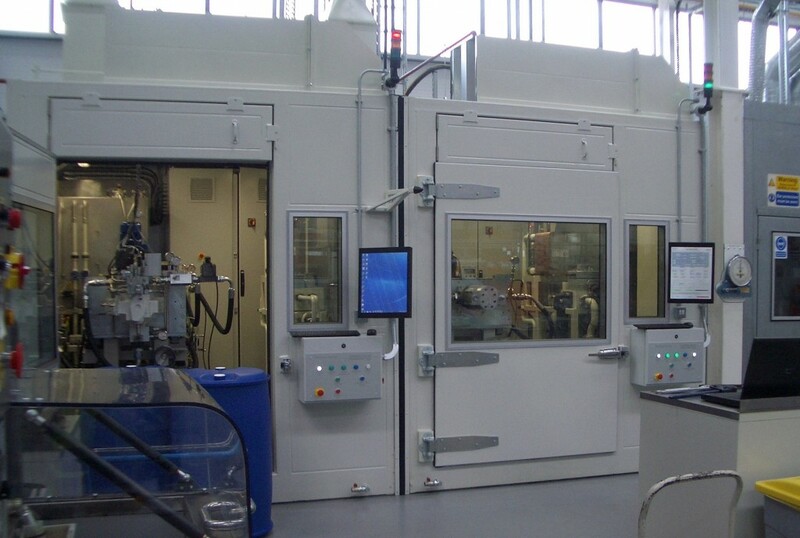 To design, manufacture & deliver two Test Chambers, each being of approximate overall sizes 3.7m long x 2.5m wide x 2.7m high, complete with bunded base, safety flooring and drip trays. fit for purpose in providing a safe working environment for operational personnel. opening for the removal of larger, heavier equipment by forklift fitted with extension forks & lifting tackle. providing a clear view of the test process. Fully bunded base with drip trays & drain points overlaid with safety grated flooring and non-slip pads. connection to customer’s extraction system, and prevents contamination of factory air by the fluids on test. The Test Chambers provided up to 30dB noise reduction, bringing external noise levels down to as low as 69dBA, well below the First Exposure Action Level of the Control of Noise at Work Regulations 2005, and allowing personnel to effectively communicate in a stress-free, comfortable environment.